The Carden Chronicles: Debt Ceiling? What "Ceiling?" Earlier today, I saw a question posed about "raising of the Debt Ceiling" The question asked, was, "do you think we should raise the Debt Ceiling because it's really just increasing the amount that each of us will have to pay for Government spending?" Great question.... 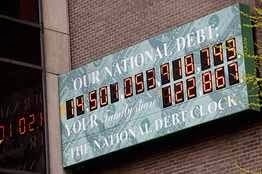 But, In thinking of this I began to wonder why we even call it a Debt Ceiling? Ceiling in this context is defined as "a maximum limit." Ceiling implies a stopping point. However, in discussing the Debt Ceiling, it never really is a Ceiling. Finally, a calm Constitutional scholar points out, "Of course Congress will raise it, the 14th Amendment says they must." Then in the very nick of time, Congress votes, Washington breathes a sigh of relief, the sun comes out, rainbows appear and all is well again- until the "Ceiling" is reached again, and the cycle starts over. Why? Because Congress has spent all of OUR MONEY they are allowed to spend; and Congress must grant themselves permission to keep spending more- of OUR MONEY. But is it REALLY A DEBT CEILING? If it were a CEILING wouldn't Congress hit the limit and be required to stop? CEILING after all means "Maximum Limit." In the case of Congress and spending Our Money there certainly does not seem to be a limit- in fact there is not even really a pause or hiatus- Congress just moves from one INTERVAL of INCREASING THE PEOPLE'S DEBT to another, with barely a hiccup. And when it is all over- actually when the next INTERVAL OF INCREASING THE PEOPLE'S DEBT begins- Washington will breathe a sigh of relief and "the People" will relax, because Congress passed a new Debt Ceiling. Throughout this crisis (of our own making), there are those that wonder, how do we prevent this vicious cycle from happening again? Perhaps if we reduced spending? Heaven forbid! Congress is addicted to bribing the people with their own money (spending). And like a drug, the amount (of the bribe) must be increased in each interval. To be fair, We The People, allow Congress to bribe us with our own money, and with each bribe we ask for more- hiding behind such "safe sounding" terms as "raising the Debt Ceiling" instead of acknowledging the truth- we allow another INTERVAL OF INCREASING THE PEOPLE'S DEBT and BRIBING THE PEOPLE WITH OUR OWN MONEY. A democracy cannot exist as a permanent form of government. It can only exist until the voters discover that they can vote themselves largesse from the public treasury. From that moment on, the majority always votes for the candidates promising the most benefits from the public treasury with the result that a democracy always collapses over loose fiscal policy, always followed by a dictatorship. The average age of the world's greatest civilizations has been 200 years. Who Really Owns the Parks?